A safe home is a happy home. And locking your door is just the beginning when thinking about keeping your home protected. You don’t have to dig a moat around your home and have heat-seeking missiles installed to keep the bad guys away. There are plenty of ways to keep your house more secure and many of them won’t cost an arm and a leg. According to the United States Department of Justice, there were nearly two million burglaries committed last year totaling nearly $4 billion. 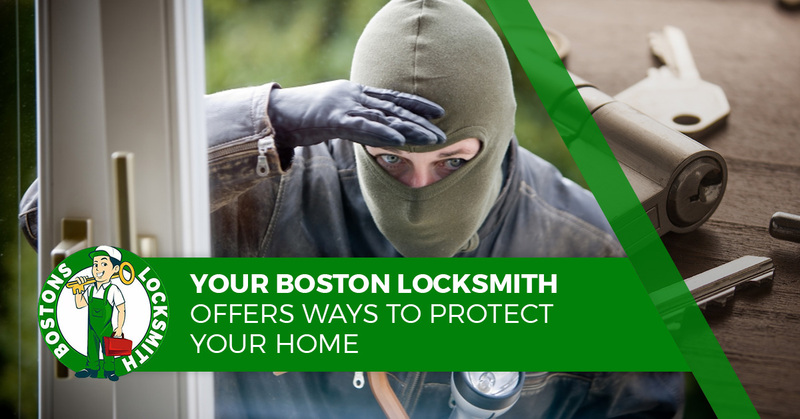 Bostons Locksmith offers these tips to help protect your home. Trees and dense shrubs next to your house can provide the ideal hiding spot for burglars. These areas are especially desired by burglars if they are not well lit. There is no need to remove trees and bushes from your yard, but you should keep them trimmed. Your best bet is to install a series of motion-sensor outdoor lights. These are great ways to deter a burglar who has his eye on your house. Motion-sensor lights can be installed or otherwise mounted almost anywhere. They don’t have to be on your front or back porch like traditional outdoor lights. You can mount them on the side of your home, on your garage, on your shed and even on your privacy fence should you choose. You can buy outdoor lights that need to be hardwired, but there are also ones available that are battery-powered and others are solar-powered. Technology has enabled us to monitor our homes with ease. Webcams feed live images from inside or outside your house to a computer, laptop, tablet or even your smartphone. This allows you to keep tabs on what is going on outside and inside your house while you are away. So go ahead and enjoy dinner and a movie, all you need to do is check your phone from time to time to ensure all is well at home. The traditional way to burglar-proof your patio doors was to jam a broomstick in the track to block the door from opening. But this looks very tacky and can be a hazard. You see, what would happen in an emergency situation if you had to exit the house quickly? You wouldn’t want to have to pull a broomstick out of the track while your house is on fire. A safer and more aesthetically pleasing solution is a deadbolt specifically made for a sliding door. These locks are inexpensive, look great and protect your home. A whole-house security system professionally installed and monitored will give you peace of mind, but at a steep price. An affordable alternative is to buy several peel-and-stick alarms and place them strategically around your house. These alarms fit in doors and windows and blare when the sensors go off. And despite their small size and low price, they have piercing sirens that will scare off any burglar. The garage is a favorite point of entry for burglars. As such, you need to ensure that your garage is secure. Make sure your garage is shut when you aren’t around, never leave your car parked in the driveway with your garage remote in it and have a decent lock put on the door that goes from the garage to your house. Statistics show that most burglars either enter through the front or back door of a residence. It is a startling statistic that shows where we need to beef up security. The most cost-effective solution is a deadbolt. Give Bostons Locksmith a call and we can have a deadbolt installed right away.